Be Authentic. Be Recognized. Be More. The Broadview® Personal Brand Discovery Tool is a powerful self-paced e-learning personal development tool. The unique, interactive development tool guides individuals through a personalized learning experience to identify the qualities that are truly authentic to them; measure with statistical accuracy how the authentic qualities are perceived by others; and use a set of personalized action-learning tools to more consistently lead with authenticity. The purpose of this development tool is to provide individuals with the practical tools that will enable and encourage them to be more of who they are and support their desire to be respected as a leader that acts with authenticity. The content for this e-learning experience is based upon the pioneering, best-selling book on personal brand, Be Your Own Brand. In this book Karl D. Speak, the principal author, made the powerful connection between personal character and perception management to create a breakthrough framework for individuals to more consciously competent in leading with their values and be recognized for their authentic leadership style. The proven learning design of the Broadview® Personal Brand Discovery Tool is based upon feedback from thousands of users of an earlier, limited-feature e-learning version of the tool. This new highly interactive, personalized app delivers a rich, easy-to-use learning experience for users. The highly engaging, personalized e-learning tool will provide individuals with the practical tools to define and prioritize his/her personal values that become the platform for her/his authentic personal brand; conduct a comprehensive online assessment of how the individual is perceived by his/her professional colleagues and personal contacts; and a set of practical, personalized action learning exercises to build her/his confidence and competence in using his/her authenticity to be a more effective team member and leader. 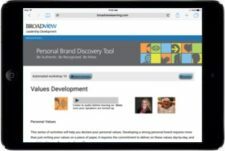 The Broadview® Personal Brand Discovery Tool is a part of an integrated suite of leadership development tools. Broadview has three specialized leadership development programs that will enable individuals to apply their authentic strengths in everyday activities or address specific leadership development challenges that were uncovered using the Personal Brand Discovery Tool. Participants are guided through a step-by-step process by Kathryn Henriksen, the designer of the course and Karl D. Speak, the author of Be Your Own Brand, the best-selling, pioneering book on personal brand that serves as the background for the audio tutorials. Each participant will learn the three practical principles of strong personal brands; a simple model for defining the perceptions she/he wants others to associate with them; a powerful assessment tool to determine how the participant is perceived by others; and a set of action-learning tools to develop strategies and plans to close any gaps between the participant’s declared authentic qualities and how he/she is perceived by others. The integrated learning design provides participants with the tools and confidence to focus their authentic qualities to be more effective in collaborating with others. This series of exercises will help individuals define their authentic qualities using the Broadview Personal Brand Platform model published in Be Your Own Brand and developed into a personalized learning tool that has been used and tested by 10,000’s of business professionals. This self-paced tutorial facilitates the participant through a step-by-step interactive learning process beginning with using a pairwise-comparison decision model to determine her/his prioritized set of personal values. Determining one’s values is an important step in building confidence in determining his/her authentic qualities. Following determining one’s values, each participant is guided through a self-paced, interactive process to determine his/her authentic qualities and how they show up in day-to-day actions. This statistically reliable, multi-rater assessment is quick and easy to implement, and provides a customized report describing how the participant is perceived by others. Professional associates, friends, and family write their perceptions of the participant in their words, unlike the preformed check-list approach used by many assessments. The completely anonymous responses from the participant’s contact list provide a statistically reliable, authentic database of trusted data for each participant to analyze. Each participant will be able to compare their list of self-described authentic qualities to the perception data as reported by others and determine their actual authentic strengths and weaknesses. The report contains a series of learning exercises to leverage one’s authentic qualities to make a difference in everything you do. Program administrators for organizations implementing the Broadview Leadership Development programs will have access to the administrative user interface providing a powerful dashboard-style management and tracking tool.